One of Infusionsoft’s most powerful features is the ability to do HTTP posts to external systems. This allows you to get your data to a service outside of Infusionsoft. Testing and troubleshooting these HTTP posts has traditionally been difficult (especially for non-programmers) but with the help of a free online service this testing is easy. To get started: Go to RequestBin and click on the big blue Create a RequestBin button. You’ll be given a bin URL which you’ll use as the POST URL in Infusionsoft. Copy the URL to the POST URL field of your HTTP post in Infusionsoft. Configure your name/value pairs following the instructions provided by the external system you are using or the Infusionsoft help center. To see what information is actually passed to the POST URL, you can click the Send Test button and select a user from the Send HTTP Post page in Infusionsoft. This will immediately send the HTTP post to your Bin URL. 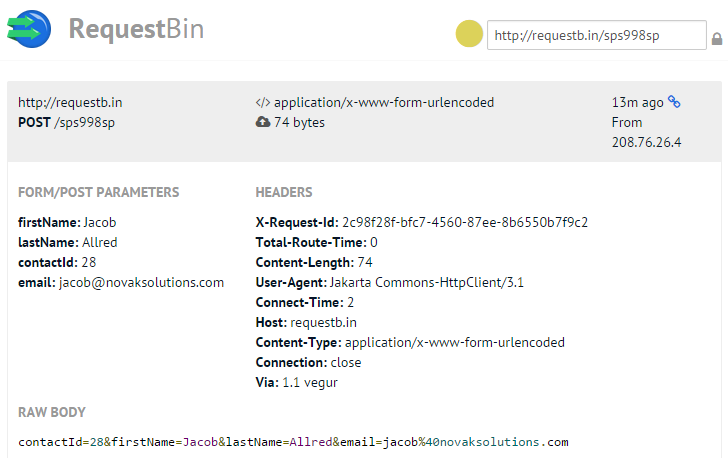 You can also run a test contact through your campaign sequence to initiate the HTTP post. The RequestBin page will update with any posts that are made to it. If the page doesn’t update automatically, click the big red circle at the top of the page to refresh the page. As you can see in this screenshot, you are given a lot of information. In this example, my first name, last name, contact ID, and email address are passed to the bin URL. For the more technical users, you can view the request headers, the IP the request came from, and the raw content. How to use this information: If the form/post parameters aren’t coming through as you expect or don’t precisely match what your external system is expecting, adjust your HTTP post in Infusionsoft and try again. Most external systems expect the data to come across in an exact format, and with the correct capitalization for field names.